In statement, Dewhurst says he acted as "concerned family member"
Texas Lt. Gov. 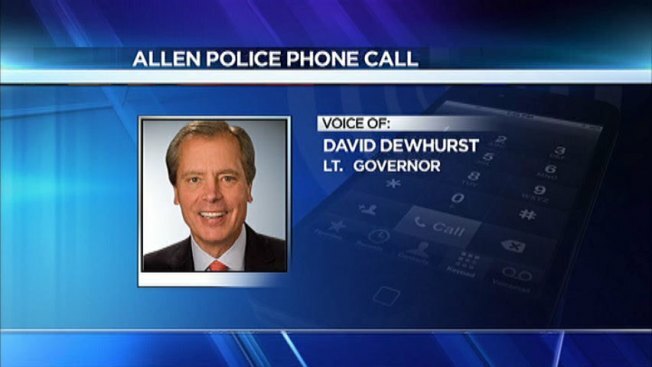 David Dewhurst personally called police and asked to talk to the highest-ranking officer about getting a relative out of jail, Allen police said. He also asked for the cellphone numbers of a judge and the Collin County sheriff, which a sergeant declined to give him. The relative, Ellen Bevers, an Allen elementary school teacher, was jailed on charges of shoplifting at a Kroger grocery store on Aug. 3, police said. Police released an audio recording of the phone call late Wednesday, after a request from NBC 5, under the Texas open records law. Sgt Jon Felty of the Allen Police Department says he was a little surprised when he heard about this call, but says nothing in the call was against the law. "What I would like to do, if you would explain it to me, sergeant, what I need to do is to arrange for getting her out of jail this evening and you can proceed with whatever you think is proper," Dewhurst said on the call. In the call, Dewhurst described Bevers as his sister-in-law but police said the woman was married to Dewhurst's nephew. In a short statement later Wednesday, Dewhurst referred to her as his niece. 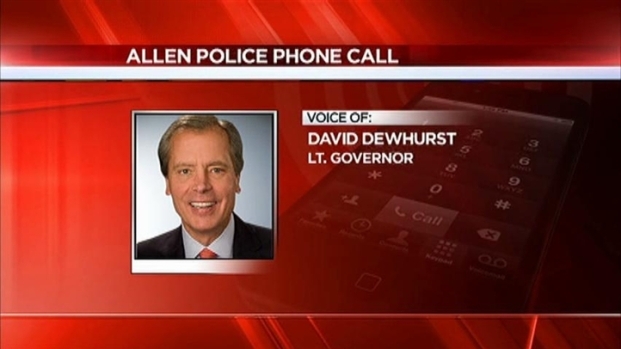 Dewhurst had called the main Allen police phone number and asked to talk to the senior officer. He was connected to the on-duty sergeant, police said. 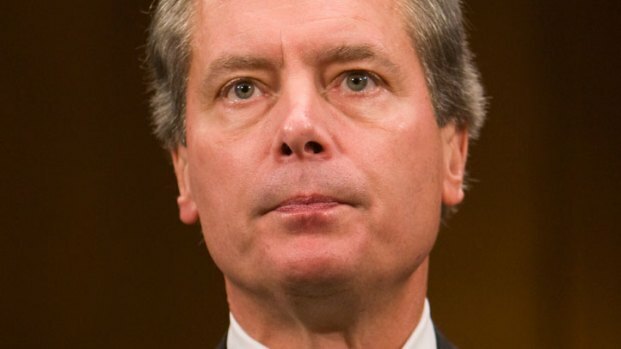 Campaign Says Dewhurst Acted as "Concerned Family Member"
A spokesperson for Lt. Gov. David Dewhurst's campaign issued a short statement saying Dewhurst was simply acting as a "concerned family member." Dewhurst said he had known Bevers for 30 years and described her as "the sweetest woman in the world." "Sergeant, you don't know me, but every year I'm the No.1 pick of all the law enforcement agencies in Texas," Dewhurst is heard saying in the recording. "I'm the No. 1 pick and I want you to do whatever is the proper thing." Dewhurst defended Bevers' character and said the shoplifting charge was a mistake. The Allen Police Department released the call Lt. Gov. David Dewhurst made to a police sergeant asking what he needed to do to arrange to get a relative out of jail. This is the first portion of that call. "This lady, I know in my heart, was not involved, in the intentional walking out and stealing $57," Dewhurst said. Dewhurst spokesman Travis Considine released a short statement and said in a later email he would answer no questions about the issue. "David acted as a concerned family member in an attempt to acquire information on how to post bail for his niece while reiterating multiple times in the full conversation that law enforcement follow their normal protocols and procedures," the statement said. Allen police released recording of a phone call where Lt. Gov. David Dewhurst identifies himself as the lieutenant governor and asks what he can do to get a recently arrested relative out of jail. Dewhurst, a longtime Texas public official, is running for re-election but had no campaign events planned Wednesday. A police spokesman said Dewhurst is not under investigation and added that the department often gets similar calls from concerned relatives after someone is arrested. Sgt. Jon Felty of the Allen Police Department said he was surprised when he heard about the call, but said that nothing said was against the law. "There is nothing criminal here," Felty said. "When I listen to this recording, I hear much of what every family member has when they have a relative incarcerated." Dewhurst's opponent, Sen. Dan Patrick of Houston, issued a statement late Wednesday blasting the phone call as an abuse of power. Texas Democratic Party Chairman Gilberto Hinojosa said Dewhurst, a Republican, "has shown that he thinks he is beyond the rules and laws that govern regular Texans." NBC 5 DFW's Randy McIlwain, Catherine Ross and Julie Fine contributed to this report.